Tom Farrey, executive director of the Aspen Institute’s Sports and Society program, gave a presentation on the state of youth sports in the U.S. to attendees on Thursday (June 7) morning. 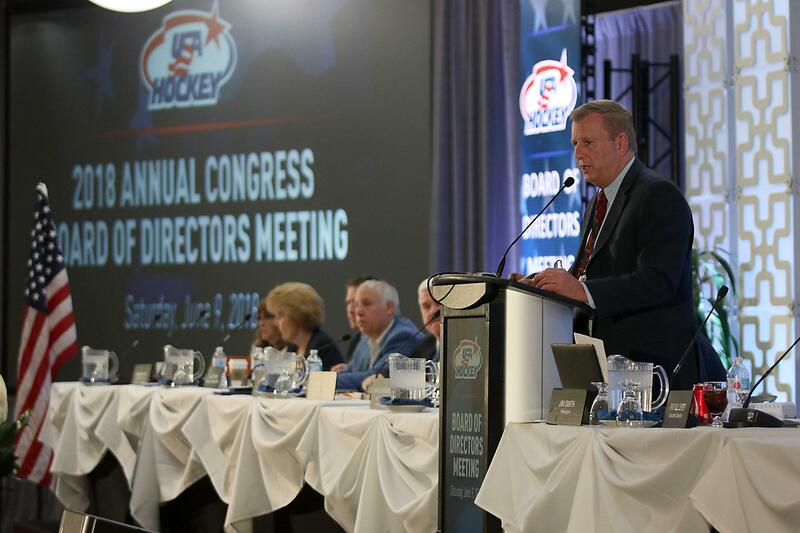 Farrey celebrated the leadership of USA Hockey, but also challenged the organization to continue to push the envelope, particularly in encouraging multi-sport play. NOTES: During Saturday’s Board of Directors meeting, Jim Smith presented President’s Awards to Flint Doungchak, (Eugene, Oregon) who currently serves as the Pacific District Coach-In-Chief, as well as USA Hockey staff members Kelley Lynch, Brad Kauhane, Chris Smith and Ralph Heffter … Dr. George Nagobads (Minneapolis, Minn.), who has served on USA Hockey’s Safety and Protective Committee for the last 34 years, announced he is retiring. The 96-year-old Nagobads, who received a standing ovation during Friday’s (June 8) President’s Awards Dinner, has been part of USA Hockey for 51 years. He was inducted into the U.S. Hockey Hall of Fame in 2010 and his numerous contributions to the organization include serving as a team physician for 30 U.S. national teams … The Annual Congress included the yearly Sponsor Summit, an opportunity for USA Hockey’s corporate partners to gather, share ideas, and hear updates about different areas of the organization … Also part of USA Hockey’s Annual Congress was the organization’s gathering with members of U.S.-based NHL clubs, as well as staff from the NHL and NHLPA office, for discussions centering on youth hockey initiatives … The USA Hockey Annual Congress included two significant award dinners and details can be found here. Among the many highlights was the celebration of the gold medal-winning 2018 U.S. Olympic Women’s Ice Hockey and 2018 U.S. Paralympic Sled Hockey teams. ‹ Congratulations to the 2018 South West Spring League Champions & Runners-Up!